For Santana, I experimented with using a more illustrative/painterly style, especially visible on her stomach. I was tempted to source light the entire thing, but with the Wyrd requirement (or so I thought) of a white background, the source lighting wouldn't have really worked. The Flesh Construct (and zombie) was fun to paint: A lot of grey was mixed into his flesh tones, and I used a colder brown than I typically basecoat flesh with. This resulted in a very pallid, 'off' seeming skintone that was strongly contrasted by Santana's warm olive tones. The brass fixtures were done to feel especially steampunk, and to tie together with the eerie fleshtone. His victim was painted very simply, meant to look like just an average dockworker. The base was done in my typical Malifaux fashion: Grey stone, washed with various colours to infuse some variety, then re-drybrushed with grey to fade out the colours more. I added some moss and water effects to get across the grimy, dockside nature of this encounter. Overall, I like the idea of this woman dwarfed by some necromantic nightmare, calmly dispatching one opponent and lining up on another. 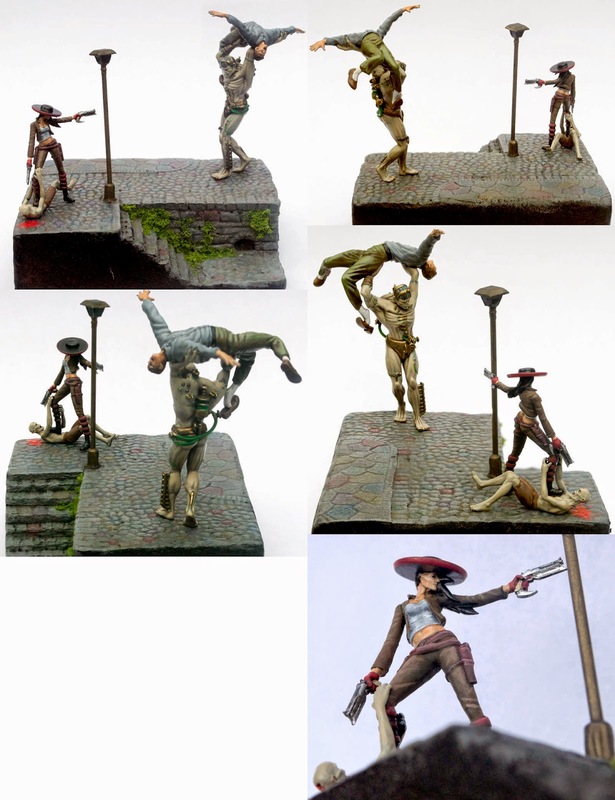 I have an idea for my next diorama too, so we'll see when Wyrd next decides to swing a contest our way!